Watch key members of the development team reflect on the creation of the original and new Castle of Illusion. 1 1/2 Cup of milk scalded in pan. 2 add 1/2 cup of sugar and 1/4 tsp of salt. stir till dissolved. 3 add 1/2 cup of half and half. 4 add 11/2 cups of heavy whipping cream. 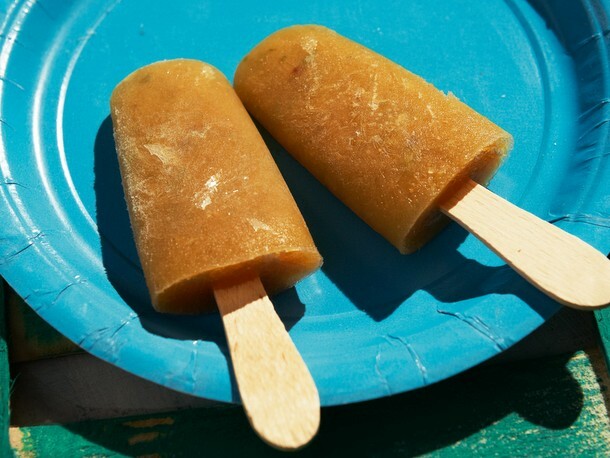 5 add vanilla, raspberry, lemon flavoring. 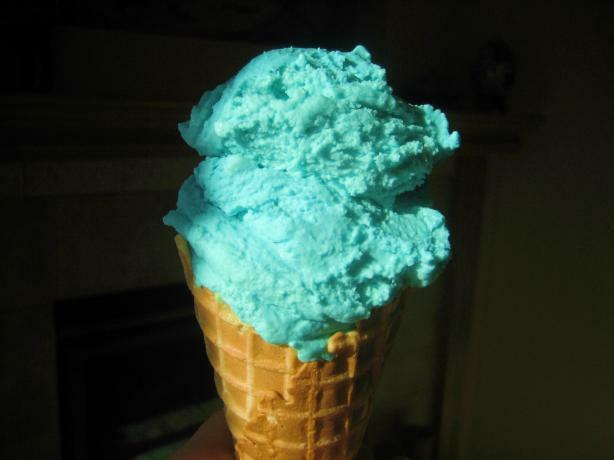 6 add blue food coloring. 7 chill in fridge till very cold. 8 put in ice cream machine! Embark on a tale with two silhouettes whose journeys intertwine to discover the mysterious world of rain. ©2013 Sony Computer Entertainment Inc. Rain is a trademark of Sony Computer Entertainment America LLC. "PlayStation", and the "PS" Family logo are registered trademarks and "PS3" is a trademark of Sony Computer Entertainment Inc. "SONY" and "make.believe" are trademarks of Sony Corporation. 1 Mix everything except for Kahlua in large punch bowl. 2 After stirring for several minutes, you may add the Kahlua if you like. 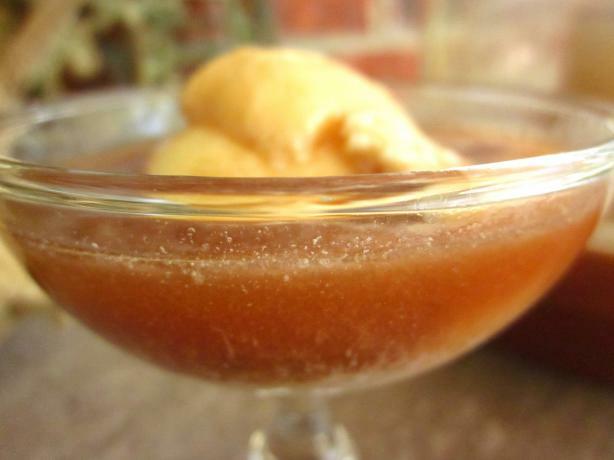 1 Let coffee ice cream warm slightly out of the freezer for about 20 minutes or until soft enough to spread. 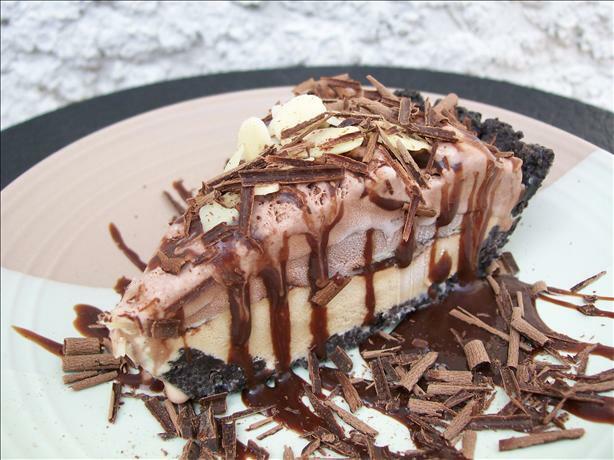 2 Spread coffee ice cream over crust and drizzle with half of the fudge sauce. 3 Freeze until slightly firm. Remove chocolate ice cream and warm slightly for about 20 minutes or until soft enough to spread. 4 Drizzle remaining fudge sauce over pie and sprinlke with almonds if desired. 5 Freeze at least 2-3 hours before serving, if freezing longer, wrap well to prevent freezer burn. 6 Serve with chocolate curls for garnish. Ever since college-bound Mike Wazowski (voice of Billy Crystal) was a little monster, he has dreamed of becoming a Scarer—and he knows better than anyone that the best Scarers come from Monsters University (MU). But during his first semester at MU, Mike's plans are derailed when he crosses paths with hotshot James P. Sullivan, "Sulley" (voice of John Goodman), a natural-born Scarer. The pair's out-of-control competitive spirit gets them both kicked out of the University's elite Scare Program. To make matters worse, they realize they will have to work together, along with an odd bunch of misfit monsters, if they ever hope to make things right. Screaming with laughter and oozing with heart, Disney•Pixar's "Monsters University" is directed by Dan Scanlon ("Cars," "Mater and the Ghostlight," "Tracy"), produced by Kori Rae ("Up," "The Incredibles," "Monsters, Inc.") and features music from future Rock-and-Roll-Hall-of-Fame--inductee and award winning composer Randy Newman ("Monsters, Inc.," "Toy Story 3"). For more information, like us at facebook.com/PixarMonstersUniversity, and follow us on twitter.com/disneypixar. The film opens in U.S. theaters on June 21, 2013, and will be shown in Disney Digital 3D™ in select theaters. For more information, check out disney.com/MonstersU. 1 Stir all together in a pyrex glass measuring cup, or what ever you have. (Use shot glasses to measure, though.). 2 Fill glass with ice. 3 Pour mixture over ice. 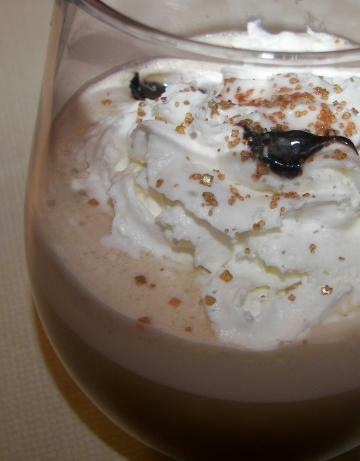 4 For extra fun, hang a small scoop of chocolate or coffee ice cream on the rim of the glass! 2 Pour in root beer. 3 Add vanilla ice cream. Melt butter in a heavy-bottomed saucepan on medium heat and cook until foaming subsides. Add sugar and stir to coat with butter, increasing heat to high. Cook, stirring occasionally, until sugar mixture begins to darken and butter smells slightly nutty, about 2 minutes. Quickly whisk in cream, taking care to watch for steam. Whisk until sugar is fully incorporated into cream and remove from heat. In a medium mixing bowl, whisk together milk and egg yolks until well combined. Ladle in hot cream mixture about 1/2 cup at a time, whisking constantly, until the side of the bowl is warm to the touch, two or three times. Pour contents of mixing bowl back into saucepan, whisking constantly until egg mixture is fully incorporated. Cook mixture on medium heat, whisking frequently, until a custard forms on the back of a spoon but a swiped finger leaves a clean line. Remove from heat and strain into an airtight container. Stir in whiskey, then salt to taste in quarter teaspoon increments. The level of saltiness is up to you, but the hot custard should taste slightly saltier than the desired finished ice cream. Cover container and chill overnight, or at least 6 hours. The next day, churn ice cream according to manufacturer's instructions. 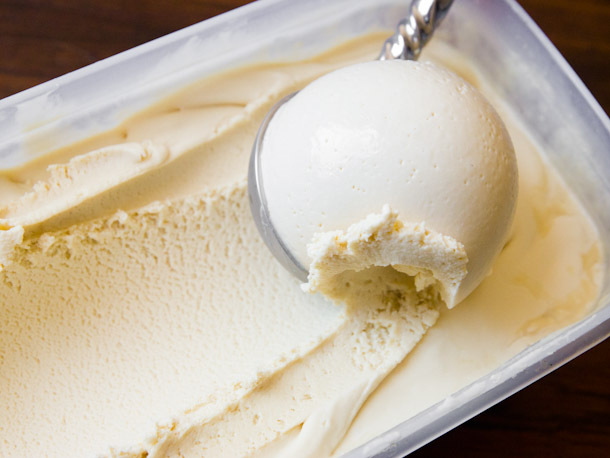 Transfer churned ice cream to airtight container and chill in freezer for at least 4 hours before serving. 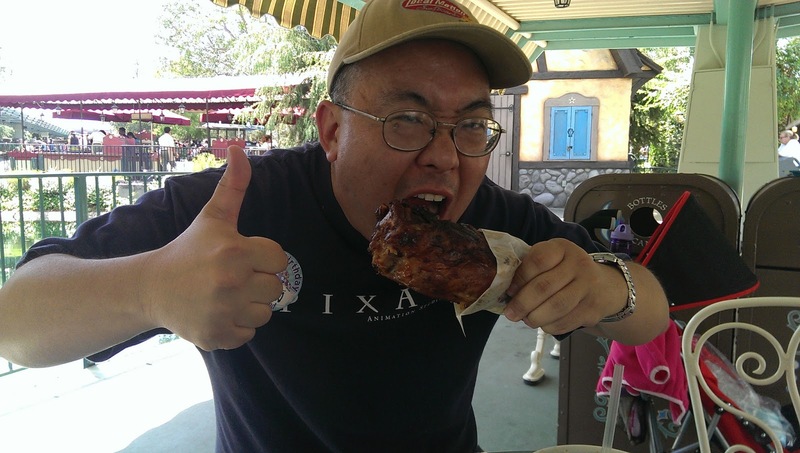 You are looking at the newest food craze to hit The Disneyland Resort! The pork shank! This was introduced with the opening of New Fantasyland in Walt Disney World and has just arrived here in California! You can find these Fred Flinstone size treats across from the Matterhorn at Edelweiss Snacks! 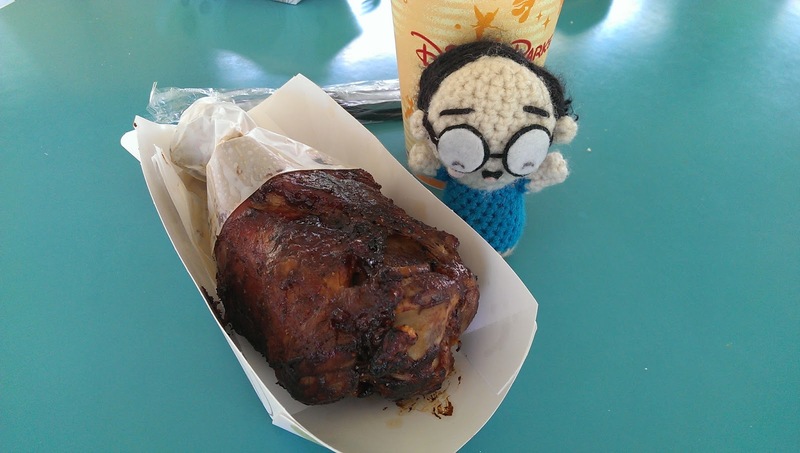 As you can see Lil Oishi is ready to accept the challenge of eating the entire pork shank! 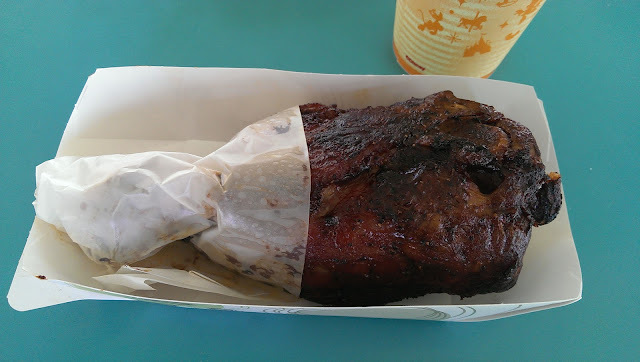 Just as big as the turkey leg! Still makes you look like a cave person! 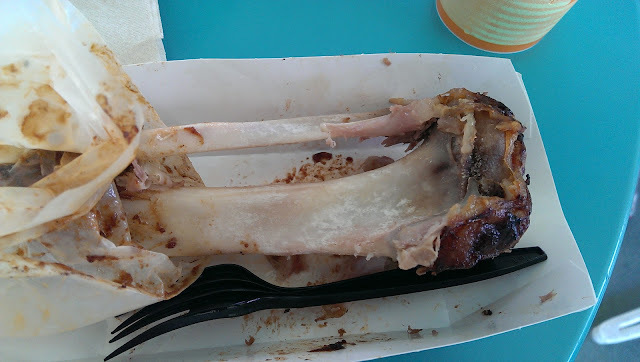 But the pork shank is not nearly as salty as the turkey leg and has a nice BBQ sauce glaze on the outside of the shank. The pork is juicy and moist and very very tasty! I have clearly found my new favorite snack! I only wish they would sell this in Disney California Adventure so I can pair it with a beer! BURBANK, Calif. (May 29, 2013) — Walt Disney Studios Chairman, Alan Horn, announced today that ticket sales from the highly anticipated World Premiere of Disney/Jerry Bruckheimer Films’ “The Lone Ranger” will benefit the American Indian College Fund. The event will take place on Saturday, June 22, at Disney California Adventure Park in Anaheim, California. A giant red carpet down the Park’s iconic Hollywood Boulevard will be lined with thousands of park guests cheering for the film’s stars, filmmakers and the many Hollywood celebrities in attendance. The Lone Ranger’s horse Silver will make an appearance and an actual train engine built for the film will be on display. Time Warner Cable, a title sponsor of the world premiere of Disney/Jerry Bruckheimer Films’ “The Lone Ranger,” will stream the event LIVE from Disney California Adventure Park. Visa Signature, a premiere sponsor, will have a fan pen on the red carpet for the first 50 Visa Signature cardholders who show their card. The Utah Office of Tourism and Film, a premiere sponsor, will provide an opportunity for guests of the park to enter to win a trip to Utah and premiere guests will enjoy a photo opportunity provided by the sponsor. Many of the movie’s memorable scenes were filmed in the Monument Valley area of southern Utah. Christie Digital, a global visual technologies company with expertise in film projection since 1929, is providing all the projection for “The Lone Ranger” premiere. A one-of-a-kind Lone Ranger Ninja motorcycle from Kawasaki, a sponsor of the premiere, will be displayed at the event and will be available for the stars in attendance to autograph. The bike will be auctioned off at a later date, with all proceeds going to the American Indian College Fund. Subway is providing sandwiches for the premiere guests. 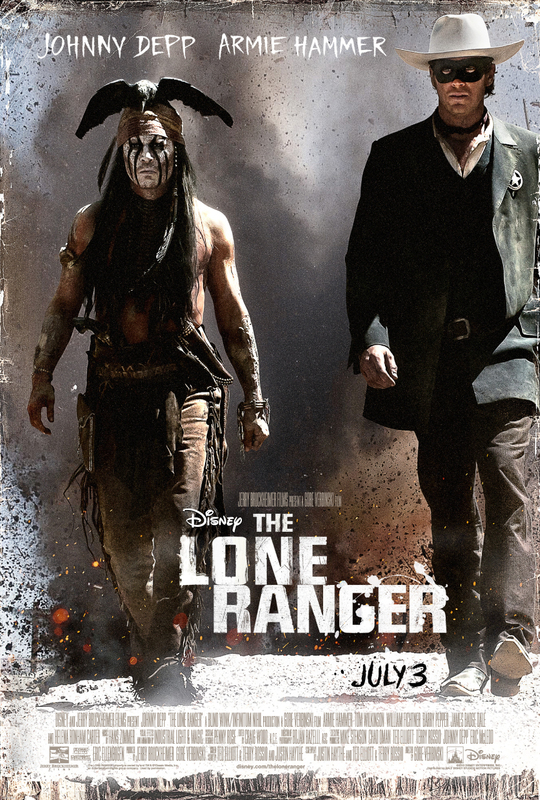 Disney/Jerry Bruckheimer Films’ “The Lone Ranger” opens in theaters July 3, 2013. With its credo “Educating the Mind and Spirit,” The American Indian College Fund is the premier scholarship organization for Native students. Created in 1989 to provide scholarships and support for 34 of the nation’s tribal colleges, the Fund receives top ratings from independent charity evaluators, including the Better Business Bureau’s Wise Giving Alliance, and received its third consecutive four-star rating from Charity Navigator. It provides more than 4,200 Native students with scholarships annually. From above the world of "Cars" comes "Disney's Planes," an action-packed 3D animated comedy adventure featuring Dusty (voice of Dane Cook), a plane with dreams of competing as a high-flying air racer. But Dusty's not exactly built for racing—and he happens to be afraid of heights. So he turns to a seasoned naval aviator who helps Dusty qualify to take on the defending champ of the race circuit. Dusty's courage is put to the ultimate test as he aims to reach heights he never dreamed possible, giving a spellbound world the inspiration to soar. Voice cast includes Dane Cook, Brad Garrett, Teri Hatcher, John Cleese, Priyanka Chopra, Anthony Edwards, Val Kilmer and David "Crofty" Croft. 1 Preheat oven to 350 and grease a 15x10 jelly roll pan. 2 Cover bottom with 1 crust, spreading to fit. 3 Layer salami, ham, pepperoni and cheese. 4 Top with crust, spreading to cover. 5 Bake 25 minutes, brush with olive oil and sprinkle parmesan cheese and Italian seasoning. 6 Bake additional 10 minutes. 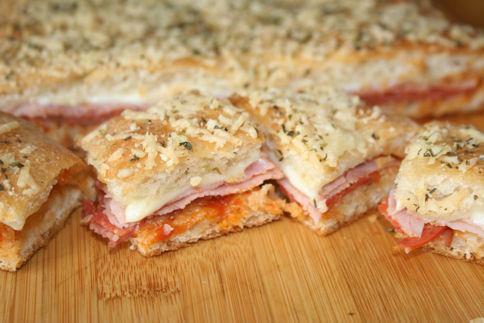 7 Cut into squares and serve with pizza sauce for dipping. 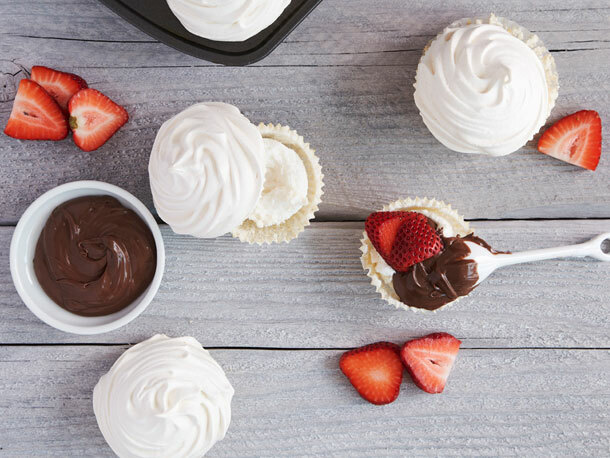 Meringue Cupcakes with Nutella and Strawberries Recipe! Hey everybody I'm back with another Kia review! This time it is for the 2013 Kia Sportage crossover! Is this your next new vehicle? Let's take a look shall we? I love the aggressive looking front of the vehicle! There is a great sense of European styling here! Plenty of room in the back. Underneath the floorboard is a compartmentalized area to store various items and under that is a full spare tire. Lots of legroom up front. The leather seats are stylish and comfortable. The review model had seat warmers and cooling. I did not get to try out the air cooled glove compartment though. For my review, I once again took off for four days to Sacramento in Northern California. 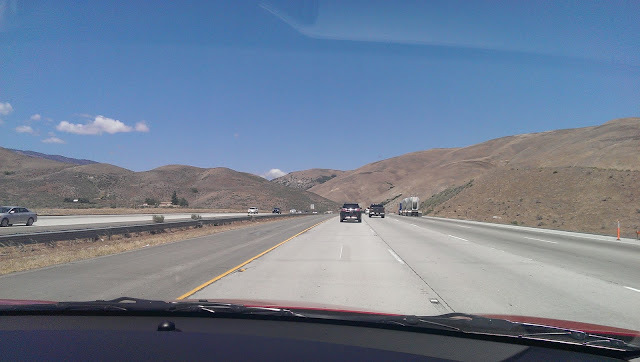 The four cylinder engine had plenty of power to handle the tough Los Angeles freeways and easily climbed the Grapevine on the way to Northern California. Acceleration onto the freeway was smooth and no lack of power to bring the vehicle up to highway speeds. I was very impressed with the power of the engine. I drove through the foothills of the gold country and the Sportage handled the windy roads with ease. The console is very elegant and thoughtfully laid out. 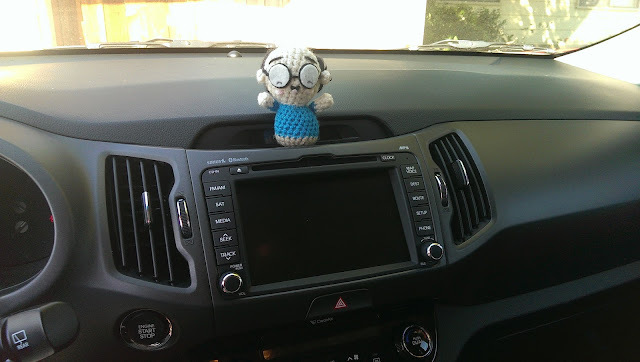 You can see the push to start button, the entertainment system with rear view camera, and the Lil Oishi is ready to drive. Once again the Sirius came in handy on the long drive to Sacramento. I love satellite radio and the amount of options to listen to on a long drive. It makes the long drive seem a lot shorter and actually makes me want to drive farther. 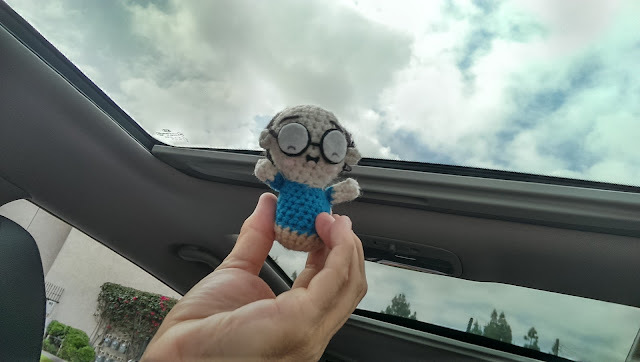 Sasaki Time mascot Lil Oishi is a fan of the panoramic sunroof! Such a pretty day to drive to Northern California! Lots of legroom and comfort in the back! Just a perfect day for driving. Taken by my passenger and not while I was driving! We had no problem heading up through the Grapevine! 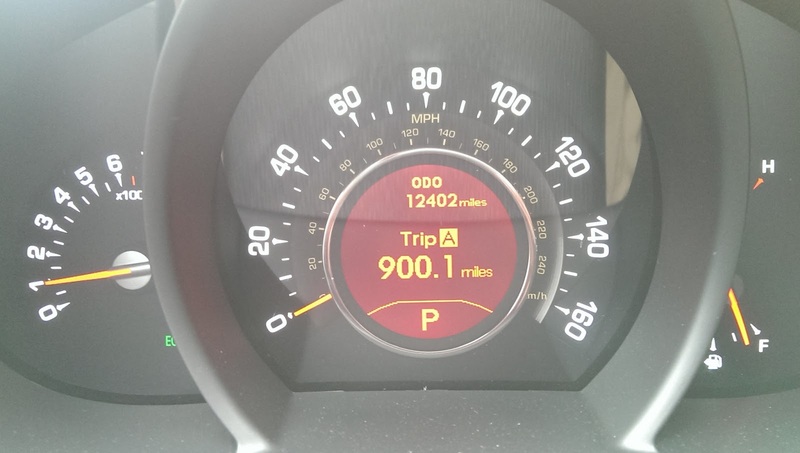 I put quite a bit of mileage during the week I had the Sportage to review. I also spent a lot of time in the vehicle to bring you a proper review. 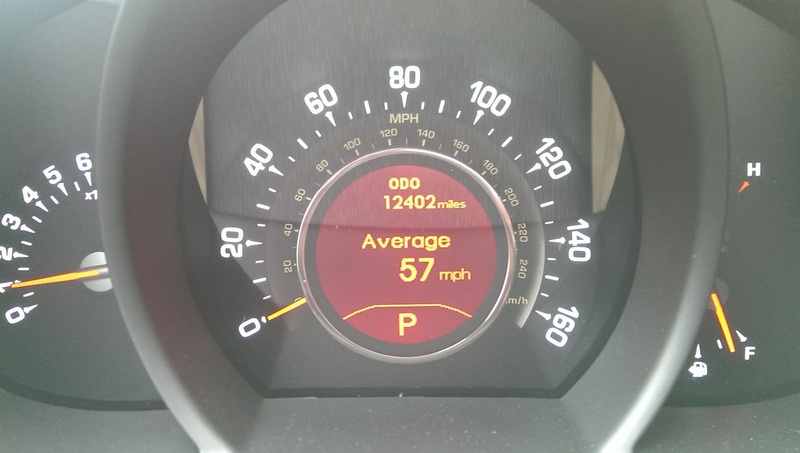 I averaged 57 MPH during my week. 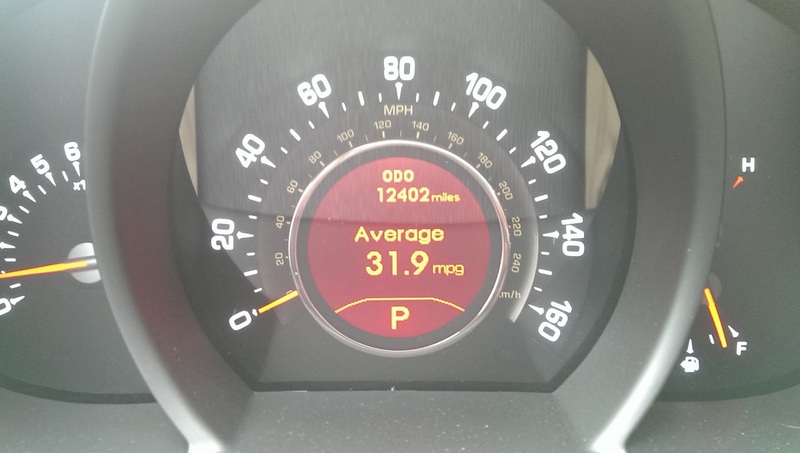 The average miles per gallon was higher than what was quoted. 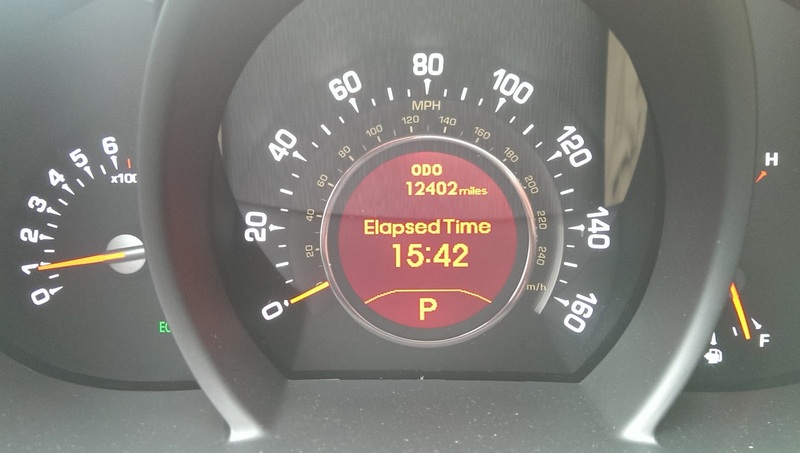 I did spend a majority of my time on the highway however. 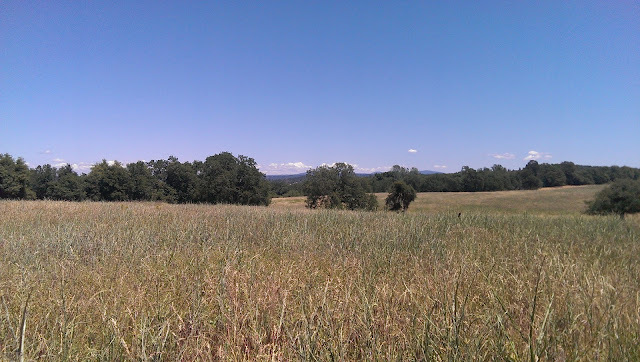 The windy roads through gold country led me to this great spot! It felt like Little House on the Prairie. 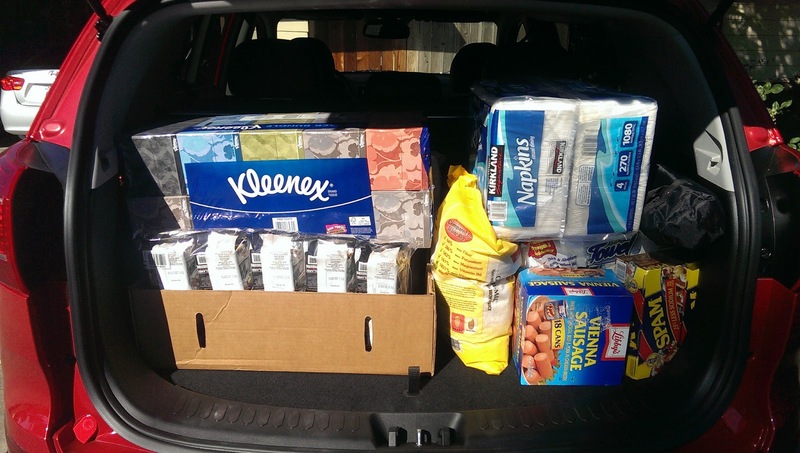 The trunk had no problem carrying a large shopping spree at one of my favorite warehouse stores! 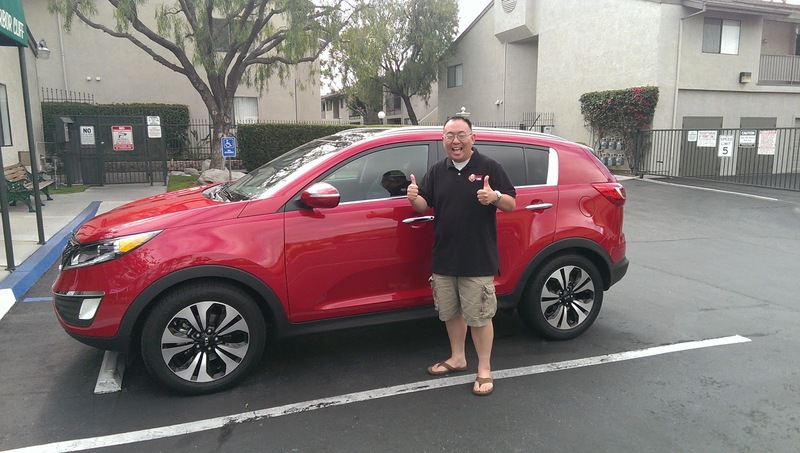 Another fantastic vehicle from Kia! 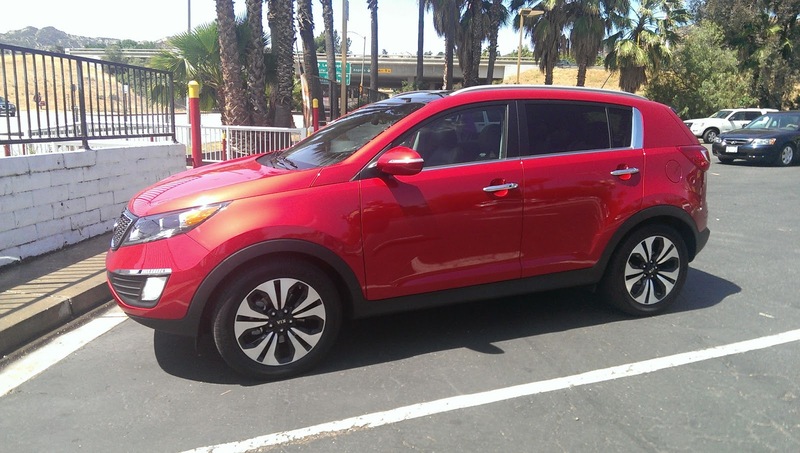 The Kia Sportage I reviewed was full loaded and priced at just under $31,000. A solid built, fun to drive vehicle with plenty of room for family and friends and luggage space! Plenty of power to handle the freeways and surface streets! This would be a vehicle I would be happy to call my own! 3 Spread evenly with softened butter leaving 1/2 inch unbuttered at one end of long side. 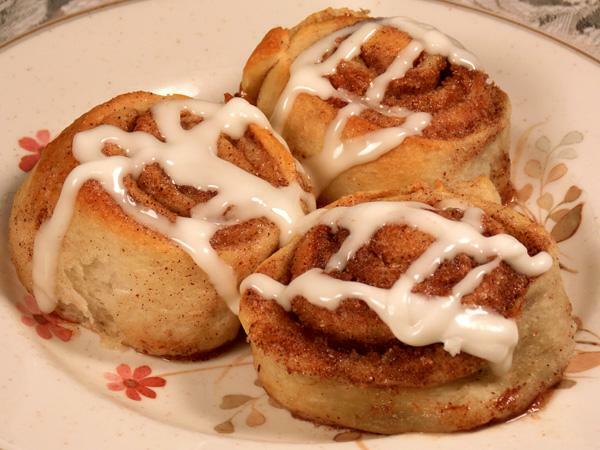 4 Sprinkle evenly with sugar and cinnamon. 5 Sprinkle with nuts or raisins (optional). 6 Roll up dough long ways and pinch unbuttered edge to seal. 7 Slice into 9 sections. place in greased 9X9 inch pan. 8 Bake for 15 minutes or until lightly browned and dough is no longer gooey. 1 Shake Rum, Grand Marnier, pineapple juice and grenadine with ice. 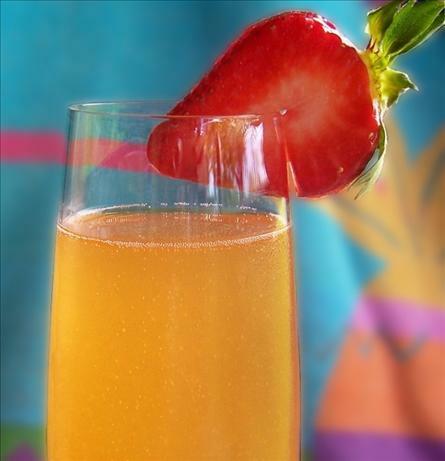 2 Strain into a champagne glass and fill up with champagne. 3 Garnish with a strawberry slice on the rim. 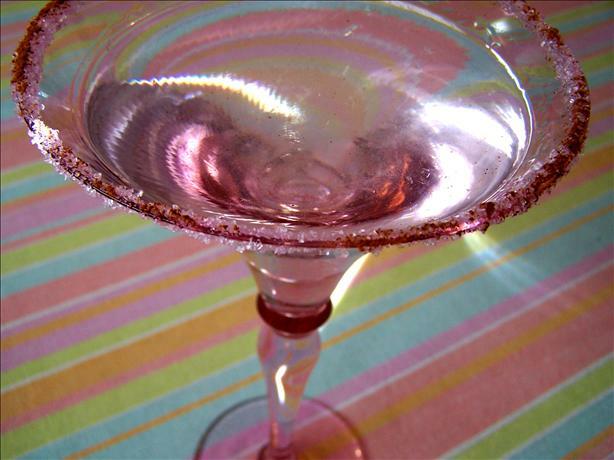 1 Dip rim of chilled martini glas in cinnamon and sugar. 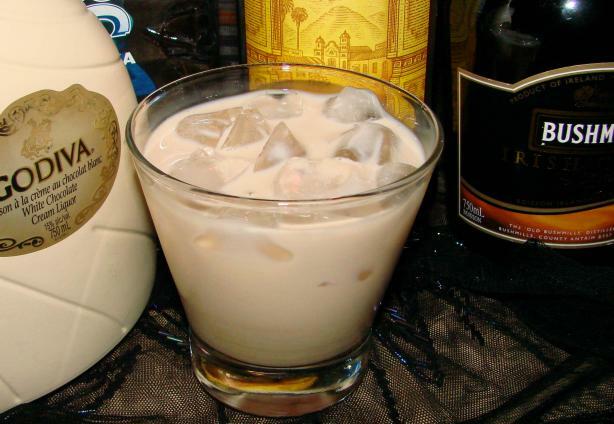 2 Combine the vanilla vodka, buttershots liqueur and cinnamon schnapps in a cocktail shaker filled with ice cubes. 3 Shake well, strain into a Martini glass, and serve. 4 Top with optional water to lighten. 1 Fill a large pitcher with ice. 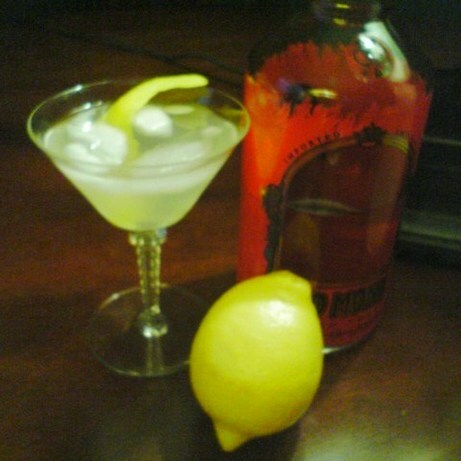 Pour in vodka, sugar, lemon zest and juice. Stir well to dissolve the sugar. Fill the pitcher with water and stir again. 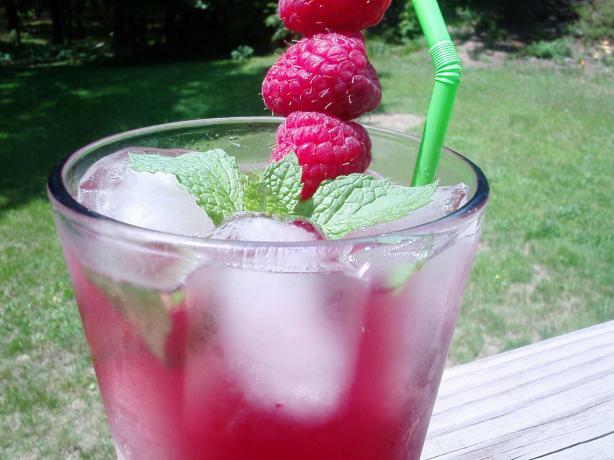 1 In a highball glass, crash the mint, lime and raspberries in the sugar syrup. 2 Add crushed ice, then pour the rum and Chambord. 3 Stir well and complete with cranberry juice. 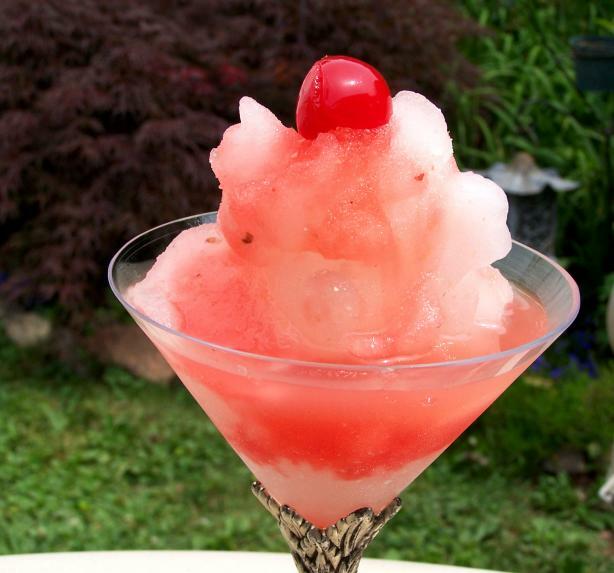 1 In a blender place ice, lemon juice, sugar and vodka add optional 2 cherries for color and sweetness. Unless you want white ice skip them in the blender. 3 Place in a martini glass piling high like a snow cone. 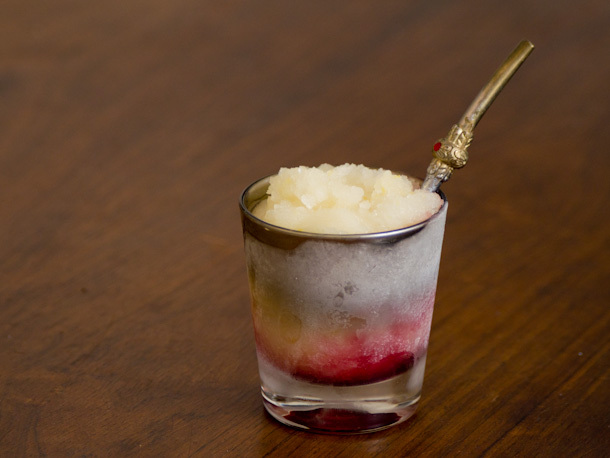 Drizzle with the maraschino juice and garnish with cherry or 2. 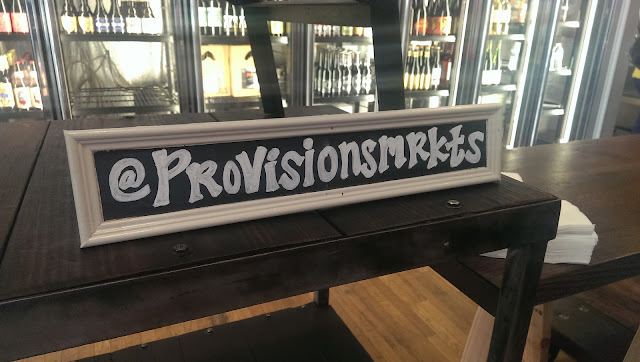 I was privileged enough to be invited last week to a special media preview of the new Provisions Market in Old Towne Orange! It was operated by The Bruery, who decided to close this space so they could focus on just making amazing beer. The folks at the Haven Collective decided to come in and reopen this space. 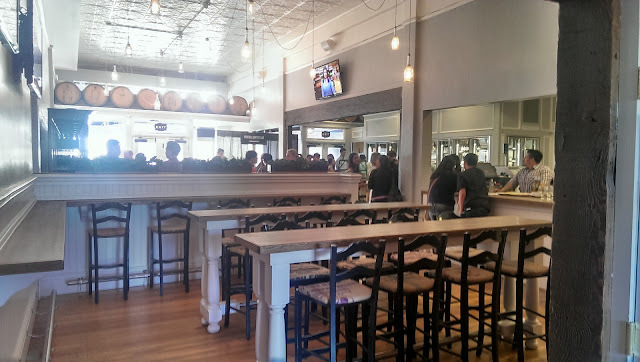 They will be offering 30 rotating beers on tap as well as various bottles of beer, wines by the glass or by the bottle, over 60 varieties of cheese, sandwiches, chocolates and the home to the second Portola Coffee Labs. Such a great space to come and have a drink as well as a bite to eat. I see myself meeting friends here after work or during the day to learn about a beer or wine or two. Then bringing home a few of my latest discoveries with some cheeses or any of the take home meals they have on hand. I love that the seats are all made from coffee bean bags. 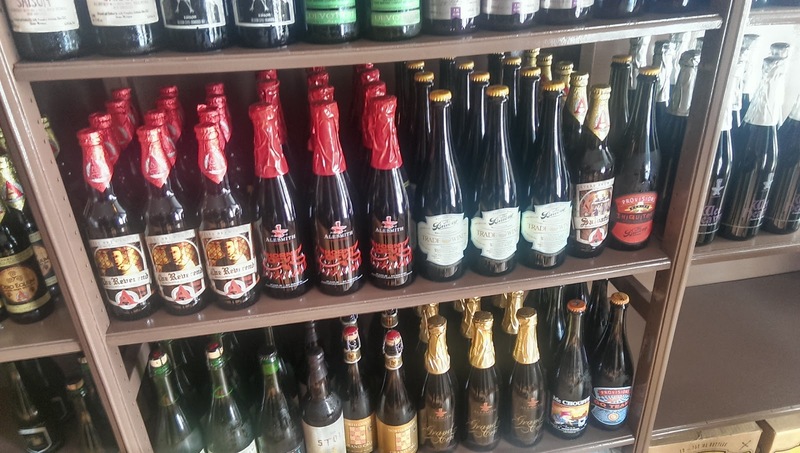 The various selections of beer are starting to find their way onto the shelves! 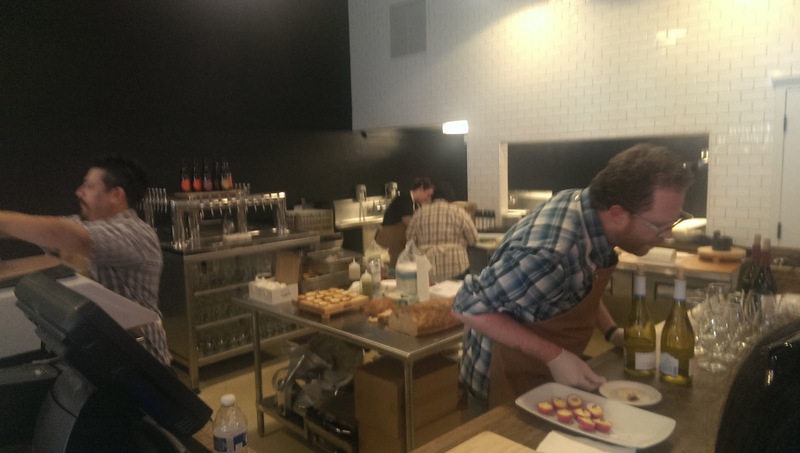 Lots of hard work going on in the kitchen space! 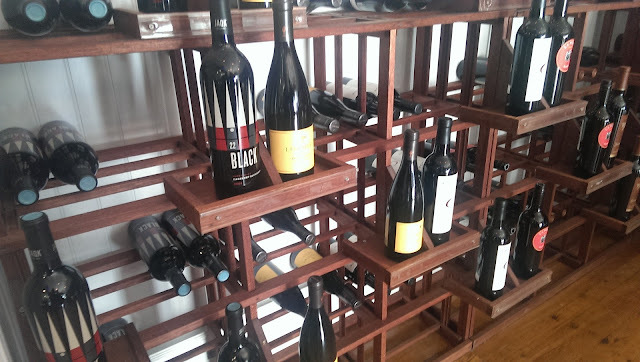 You are going to find some amazing food pairings here. They were creating such amazing items such as these beet-habenero deviled eggs! I could not stop eating them and had to walk away from them to keep from eating any more! Some amazing burrata atop bread! 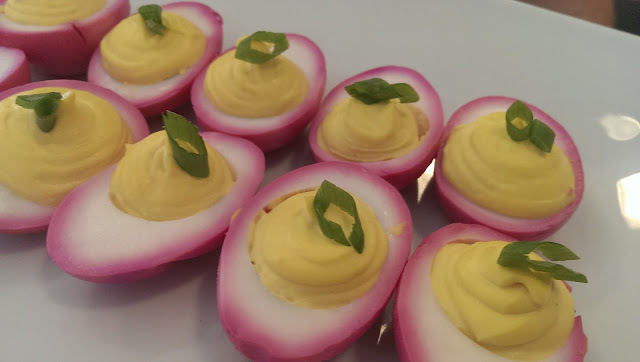 These were almost too pretty to eat! 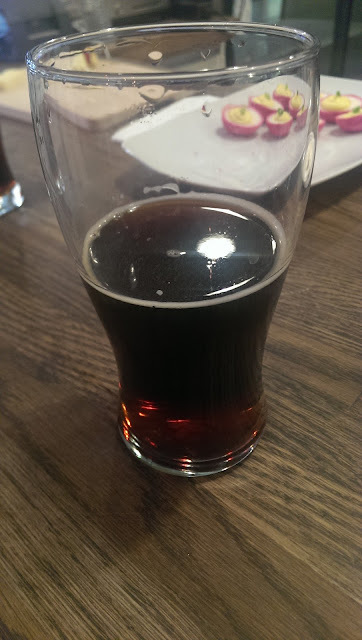 Trying the delicious Nut Brown Ale! I am a huge fan of ale's and this reminded me of a Newcastle. 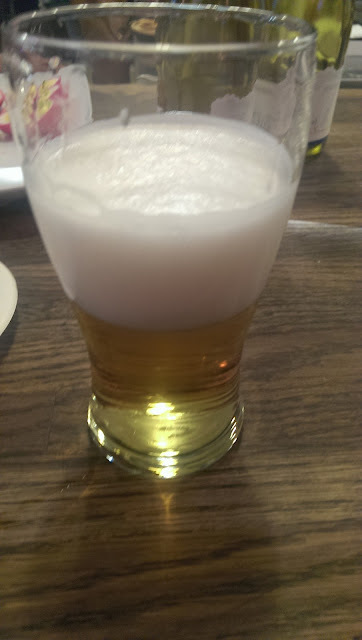 They also had a nice pilsner on tap as well! It was nice and light with a bit of a citrusy taste. Many of the cheeses on hand paired perfectly with this one. The bottles of wine are elegantly displayed. I loved the rustic feel on the inside of the store. This will soon be the home to Portola Coffee Labs second location. My favorite place for coffee will even be closer to me! My first cup of many from Portola Coffee Labs second location opening late this summer. This is going to be a wonderful place to stop by for a drink and a light meal before heading home after work. 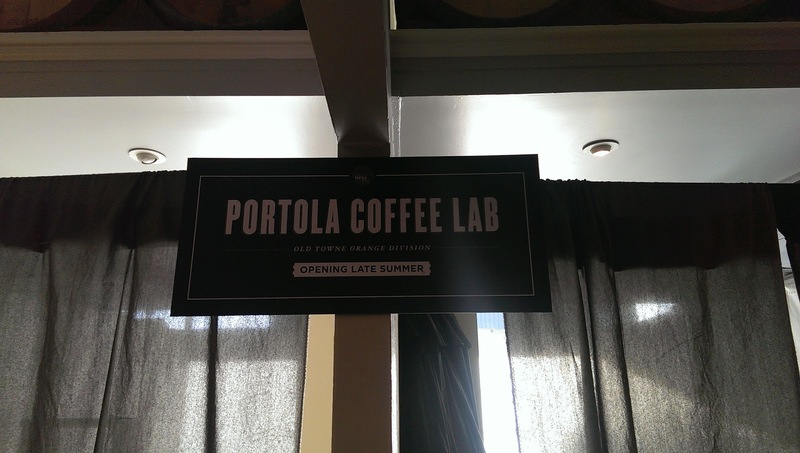 I look forward to the opening which looks to be around June 1st with Portola opening later in the summer.